Hmm... Not sure why Gul'dan staff is "Horde" exclusive but whatever I like the look. 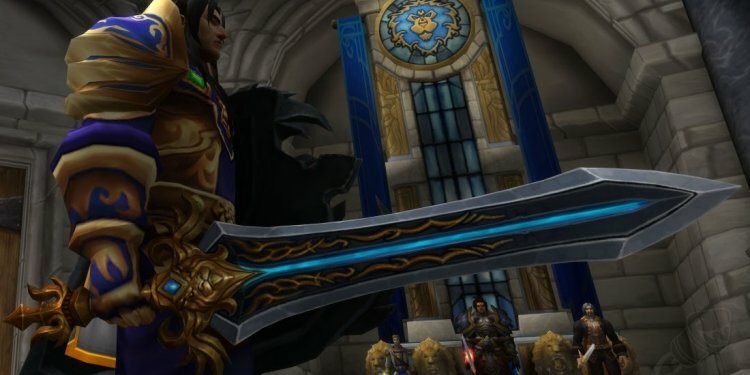 I wonder is the pre patch supposed to come as early as the international release (whenever that is) or is there going to be a physical version of it using the current transmog system? While I'd love to see the former its not happening. To many bugs on alpha right now and the pre patch hasn't even glanced PTR. It won't be ready in a month... But maybe I'll be surprised... We'll see. A Warlock's dream came true! This staff is the lost piece of set! Definitely gonna transmog my Aff Locks artifact to this. A scythe is really cool and all, but who wouldn't want to carry around the weapon used by Gul'dan himself, the greatest mortal warlock to have ever been? Not going to lie, disappointed that the staff is horde only. It says "added in patch 7.0" But its on a 6.2 patch on the PTR right now. So that's not entirely true. Time to level up a orc warlock! As someone with an Alliance warlock...salt levels are real. Not saying they should remove the "faction" only thing but they should. Basically like the situation was with Admiral Taylor's sword for the Horde, they eventually relented on that one so hopefully they will here too. Once I saw the alliance sword and shield I fell in love. Then I encountered the Horde axe and felt betrayed... but this staff makes the betrayal bitter sweet! Amazingly detailed staff at the cost of a green quality looking axe. Worth it. Just got this in the mail along with the other movie related transmog items. Remember to check your other faction for each one has different items. You can not use all 4 movie replicas if you are a Pandaren! The restriction is race related, but it is also faction as well. If I send the staff to an Alliance warlock, will it be counted for the wardrobe or is it a perma-lock out situation? I just think that this would look pretty sick on a Destro Worgen lock. Mailing this to an alliance toon will switch it one of the alliance only weapons and vice versa. This staff goes excellent with (if you are Horde that is... sad day for Alliance players.)! There were some other good choices in the past but his staff does rise above them all imho. It hasn't been mentioned yet, but this staff model does NOT seem to take enchant illusions. The other weapons (Replica Lion's Fang and Replica Blood Guard's Cleaver) are able to take enchant illusion. This weapon now shows enchants! The enchant covers the entirety of the weapon. It's sick. Unaware that accounts without an active subscription can't access the mail I made a new horde char to get the items. I can't get them out of the mail, if they're even in there at all. And I can't log on to a different Horde char on an active sub as it's once per account. What do I do now? I can reactivate my sub but will they show up in the newly made char's mail? My main account with an active sub didn't have an open character slot and I didn't think about not having access to the mail. The items would have gone to the first character of a given faction that logged in. You could activate that account to recover them but if you aren't in a hurry they will just add to the Transmog collection once that feature goes in with that content patch. as long as you received the achievement the items for both factions will be added to your collection once the system is implemented. Is the sheild, sword, axe, and staff the only promotion items we get or is there going to be more coming?. . . Just out of curiosity. Can also confirm Replica Staff of Gul'dan can be used to Transmog on 2h Weapons, like 2h axes, swords, maces etc. Are you a cloth-wearing Goblin? Grab a dark hood, a black robe and you will be ready to dwell the darkests tunnels. Are you an Orc Monk (or even an Survival Hunter, if Legion will let us do that)? Then go for the most tribal armor you can get and you will be following the Old Ways. I don't get it. It was an item level one staff, 2.39 dps with no stat bonuses. It didn't seem to be anywhere near as good as my existing staff so I disenchanted it. There's a lot of talk in these comments that I don't understand but I'm beginning to think that was a mistake? I accidentally deleted my alt character... with the staff on it, anyone know if I could get another somehow or place a ticket? I just had an issue because i couldn't find my staff anymore and the answer I got after opening a ticket was that I had deleted the staff and so they sent me another one as an exception. I just wished that i had come here first to see that you cannot send the staff from a horde to an ally and the person that answered me should have told me so instead of telling me that it was my fault when really it was an ally/horde issue. II have been opening thickets for nothing because i got a wrong answer from someone that didn't know squat about this issue. Very frustrated to have lost 1 hour of game time on this issue for nothing. am i the only one that has noticed when i have my staff mogged to this and i get on random mounts it glitches? If I send this account bound item to an alliance alt, they receive "Replica Lion's Heart" rather than an alliance staff.